When starting this crazy project the last thing I expected to take part in was the telling of ghost stories. Reviving the artistic corpses of long forgotten stars like a musical Dr. Frankenstein, yes, I’d have gone along with that characterization. After all with so many rock artists to delve into over the past seventy years there were bound to be plenty who’d long since faded from view, even those who were hit-makers long ago. So in part the entire premise of Spontaneous Lunacy was to ensure that nobody was completely overlooked historically. Time has a way of obscuring the details of all but the most hallowed of names, so naturally the job description here includes opening a few locked doors, unsealing boxes of long forgotten records, dusting them off so we could revisit them and in the process shine a light into the corners of dark musty rooms to see who was there, waiting for reappraisal. In that hunt I knew we’d find plenty of artists who’d been shoved in the back of closets to make room for newer has-beens, all of them eventually having the door shut on them for decades, never to cross anybody’s mind for years to come. When that door was opened however they’d spill out onto the floor in a tangled heap and slowly picking through them was certain to elicit glimmers of recognition and exultant cries of, “Ohmygod, I remember him/her/them!”. But I wasn’t expecting ghosts to fly out with them. Artists who the closer you looked for them the more transparent they seemed to become. Historical apparitions with no tangible backstories to fill in the blanks. That was something I didn’t anticipate, and if there WERE some that floated into view it certainly wouldn’t be anyone who actually had a legitimate HIT, and a well earned one at that, and whose career was tied to somebody who was in no danger of being obscured by time. Yet here we are once again meeting up with a rock ‘n’ roll phantom of the first order in Joe Swift. A hazy specter of a singer who seems to have existed for just a few short months, a mysterious name on some record labels before he vanished forever leaving behind far more questions than answers. When we last encountered Joe Swift back in September 1948 with the intoxicatingly good That’s Your Last Boogie, a record which undoubtedly featured the best musical arrangement to date on any rock release, the weakest point of the performance unfortunately was Swift himself. Though he employed a very good approach to singing by using a stop-time pattern which heightened the tension and made each payoff all the more interesting, it seems Mr. Swift had the unfortunate medical malady of having his larynx located deep in his nose rather than his throat like most people do. Now to be fair lots of very popular singers over the years have what is referred to as “nasal” voices, in fact three of the biggest lead singers of the 1960’s – Mike Love, Diana Ross and John Lennon – all sang through their nose far more than is recommended. But they all take a back seat to Swift who almost sounds as if he sang without even parting his lips! The record itself though was SO good, and because Swift was not just the vocalist but the songwriter, I almost felt bad criticizing him and suggesting that it might’ve otherwise been a perfect 10 had somebody else sung it. 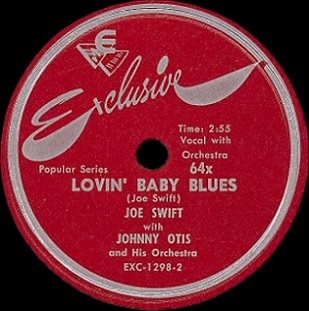 Throw in the fact that the record was not only a charted hit, still something notable in rock’s first year, but also the first hit to feature the likes of Johnny Otis who led the band and went on to a 60 year career as one of rock’s leading lights, that makes the achievement all the more noteworthy. Since Swift’s career seemed to be all but erased from the collective memory of everybody in the years since, Otis included, who never again mentioned him in any interview or book he wrote, it’s about time some belated glory came his way. The B-side to that, What’s Your Name, though suffering from the same clamped nose singing technique, was also better than average and while it wasn’t nearly as ambitious as the top side and had a much more simplified arrangement, it was still highly enjoyable even if Swift himself could’ve conceivably been replaced by dozens of other vocalists and had the record turn out even better. So now here is Joe Swift’s follow-up, giving us a chance to re-assess his work and maybe report our findings a little differently, allowing him to reap the rewards if Lovin’ Baby Blues turns out well. On the other hand… maybe just go back and re-read those other two reviews again because not much has changed. Of course, that also means that Lovin’ Baby Blues is still pretty darn good. Not quite as good as “Boogie” but it’s really solid throughout. A lot of the arrangement is carried over from That’s Your Last Boogie with only a few surface differences. Devonia Williams’s piano leads off and takes an even more prominent role in the proceedings, which is always nice to hear because Lady Dee as she was known was a great pianist, adding hip textures to everything she played on. But then the same approach that worked so well last time out is recycled almost verbatim, from the claves to the interlocking drums and maracas. It’s played with more haste here, there’s not as much stand-alone space for each instrument so it feels more condensed, though it’s still very hypnotic and well-played, but it’s just that the startling originality of it the first time around is the one thing that can’t be replicated. Once we’ve heard it on “Boogie” this is going to seem like a virtual replay, no matter how effective it remains. Then there’s Swift to contend with. The same ol’ Joe. By the sounds of it he hasn’t shaken his head-cold because he still sounds so clogged up that two sticks of lit dynamite shoved up his nostrils wouldn’t clear his sinuses. But by now we’re kind of used to it, maybe not quite enough to overlook it, but we’ve learned to tolerate it to a degree. So it’s sad to report that what he’s singing isn’t quite up to par with what he sang last time out. This time around he’s playing the lothario, claiming he’s got fifteen women already but wants one more because “the ones I’ve got are good-for-nothins but to cook and scrub my floor!”. Not exactly enlightened sort of fellow, is he? Of course the focus of his pleas, presumably those females who are using records in place of want-ads to find a boyfriend, will be treated differently he assures us. Apparently he already has all he can eat and his floor is spotless so this new gal will only be required… to get it on with him in the sack! Well, I suppose that kind of offer IS hard to turn down but suddenly I don’t feel quite as bad about disparaging Swift’s mere singing voice when he is so convincing in the role of a Neanderthal. It just makes you wonder what he promised those other fifteen gals when he was “recruiting” them. Maybe rather than get rich pimping he’s trying to start a housecleaning service to make his fortune! But this isn’t the moral conduct code we’re reviewing here and while generally speaking I draw the line at the more egregious acts of human trafficking in the name of musical merriment, the fact is that, with Lovin’ Baby Blues in any case, Swift doesn’t seem to be quite as successful with his goals as he’s making it out to be. He’s almost TOO boastful to have you believe what he’s saying, tossing around declarations with assurance that he’ll be well-worth this for any girl daft enough to take him up on his offer, all while the smarter ladies listening are rolling their eyes and ridiculing him to one another. Meanwhile Otis for his part, not wanting to be complicit in any of the borderline illegalities that Swift is perpetrating (after all, it doesn’t sound as if Joe’s having these girls fill out W-2 forms, offering them health insurance or making contributions to a 401K plan), wisely steers the song away from Swift’s roll call of boasts. There’s a sinuous sax solo that takes up a good portion of the song, followed immediately by a trumpet wailing away, possibly calling in the cavalry but more than likely just trying to distract anyone from calling the law on Joe for his cruder come-ons. The sax works better than the trumpet, something that should go without saying by now for regular readers of Spontaneous Lunacy who well know how the dividing line between the rock era and what preceded it was largely the sax taking over the role of the trumpet that had been featured in jazz. But, jazz-lover that Otis was, he finds room for both and the record’s not any worse for their sharing the stage, as the trumpet here is better than most of what we’ve heard that instrument come up with thus far in rock’s story. The closing section is the highlight though as Swift fades away, the horns drop out to give the rhythmic accents and the piano the stage to themselves. There’s some random shouts from the band, whooping it up and enjoying themselves as they take this to the finish line without the burden of carrying Swift on their collective backs. In truth the whole thing would’ve been better as an instrumental. There’s no doubt that Otis had the tightest most proficient band on the scene in 1948 and this gave them another chance to show off. As for Swift, he’s enjoyable enough I suppose, though we remain a little hard on him, not just for his nasal tones this time but for the words that come out of that nose… err mouth… as he sings. We still need to keep in mind that this was merely a song, nothing to take too seriously, no reason to call for him to be locked up… unless of course his parole officer was also a vocal coach who could improve upon his delivery some, or unless your own daughter was one of the ladies answering Joe’s ad. Who knows, maybe some irate father, brother or husband shot Joe Swift and condemned him to a life of purgatory in the netherworld and that explains his wraith-like historical fate. Overall this is still a good record, one worth hearing if only for the byplay of the band when they’re hitting on all cylinders. Swift’s role is essentially harmless and we have to at least give him credit for twice now providing Otis’s band with the song which with they were able to shine. Maybe it’s not surprising after all that Joe Swift’s place in rock history was soon forgotten, but in the waning months of 1948 when rock was now just firming up its position in society it’s important to remember that it was Swift who’s given us two quality records in two outings and has us curious to hear more going forward. We’re reasonably sure the same deficiencies will continue to plague him, but we’re also confident that as long as Johnny Otis has anything to do with it the positives will outweigh the negatives. So chalk this one up as something ultimately worthwhile and as long as none of the female readers feel sorry for Joe and decide to respond to his requests everything should be okay in the end. Leave a reply on "Joe Swift: “Lovin’ Baby Blues”"